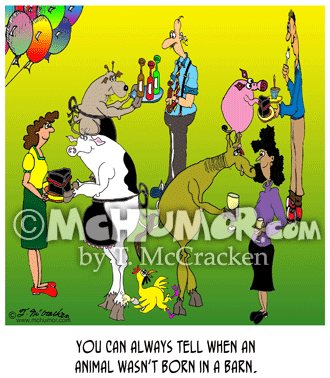 Farm Cartoon 8326: "You can always tell when an animal wasn't born in a barn." 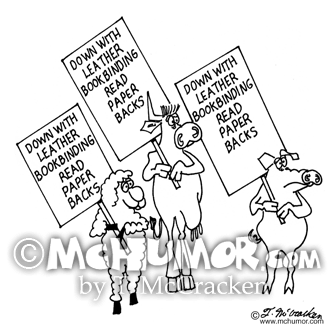 Cows, pigs, goats, horses and chickens serve food and drink at a party. 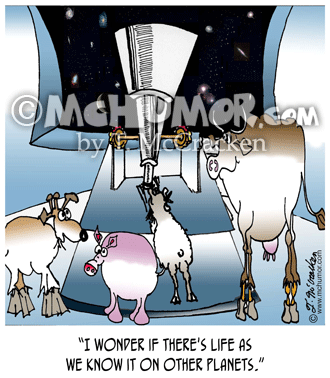 Astronomy Cartoon 6256: A goat looking through a telescope saying to a pig, a sheep and a cow, "I wonder if there's life as we know it on other planets." 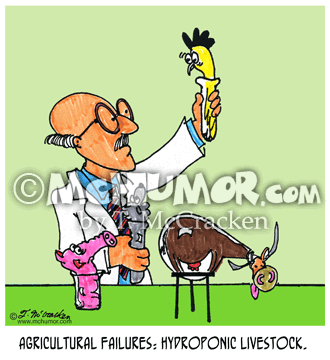 Beef Cartoon 3218: "Agricultural Failures: Hydroponic Livestock." A scientist looks at tiny cows, chickens and pigs in test tubes. 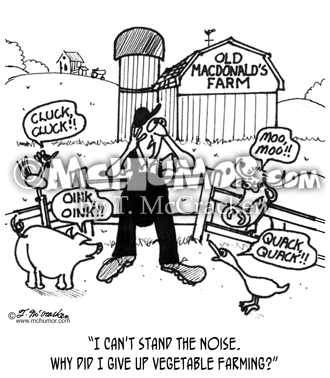 Farm Cartoon 3222: Old McDonald covering his ears as animals oink, oink and quack quack around him saying, "I can't stand the noise. Why did I give up vegetable farming?" 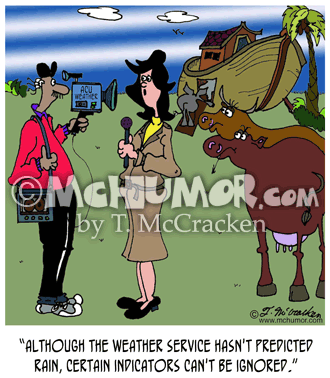 Weather Cartoon 5592: A weather forecaster looking at animals boarding an ark saying, "Although the Weather Service hasn't predicted rain, certain indicators can't be ignored." 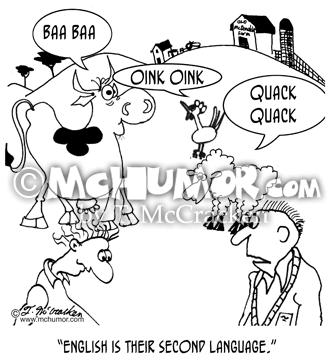 Language Cartoon 7694: Of a cow that's baaing, a sheep that's quacking and a chicken that's oinking a farmer says, "English is their second language." 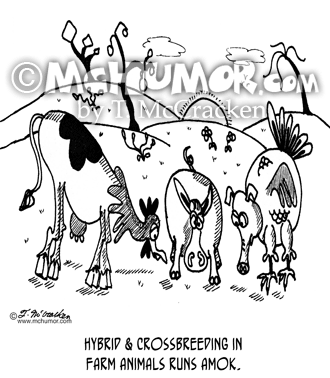 Breeding Cartoon 8136: “Hybrid & crossbreeding in farm animals runs amok.” Farm animals that are combinations of animals: a rooster’s head on the body of a cow, a horse's head on the body of a pig and a pig’s head on the body of a rooster." 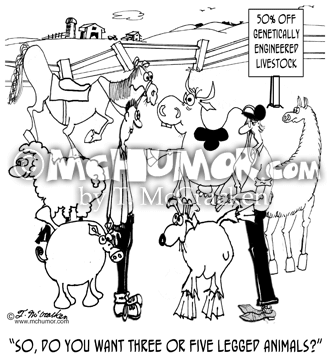 Breeding Cartoon 7623: An animal breeder adverting "50% off all genetically engineered livestock” asks someone, "So, do you want three or five legged animals?" 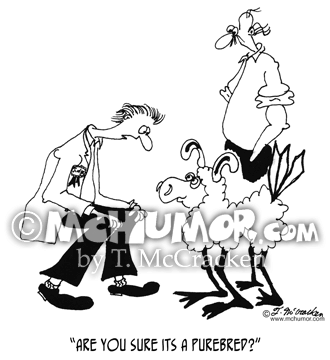 Sheep Cartoon 5659: Of a sheep with webbed feet, dog ears and feathers a man asks, "Are you sure its a purebred?"